It is almost like going around a botanical garden full of exotic flowers, some of which may look similar to lilies and marigold. But this garden of nanoflowers can’t be relished with naked eyes. You need powerful electron microscopes to wander in the ultratiny world of nanoflowers. A typical nanoflower may be 1000 times thinner than a human hair. The emerging science of nanoflowers is attracting the attention of scientists and industry because of their high stability and enhanced efficiency. 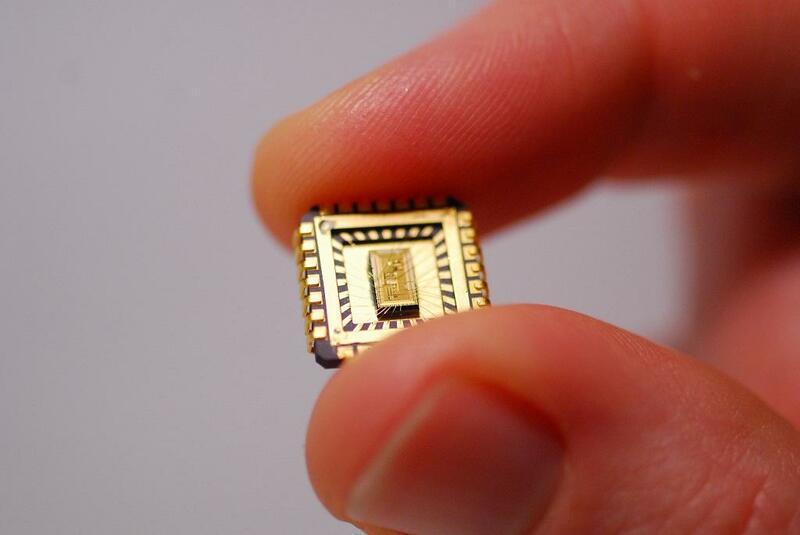 Nanoflowers can find applications in optoelectronics devices or sensors, catalysis and solar cells. It has been discovered that nanoflowers have great potential for possible applications in nanotechnology, for example, as sensors for hydrogen peroxide and glucose, as well as for field emission properties. Researchers across the world have obtained a series of nanoflowers and nanoflower-like structures by varying temperature, reagent ratio and other reaction conditions. 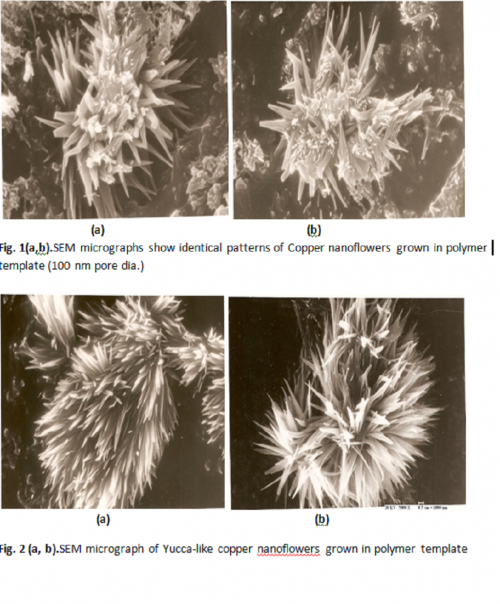 Nanoflower structure primarily consists of simple nanostructures such as nanorods, nanowalls, or nanowires. Nanoflowers of almost all metals have been reported in the form of elemental nanoflowers; metal oxide nanoflowers; nanoflowers of hydroxides and oxosalts; sulphide, selenide and telluride nanoflowers; nitride and phosphide nanoflowers; as also nanoflowers formed by organic and coordination compounds. During 2008-11, our laboratory in DAV Institute of Engineering and Technology, Jallandhar was involved in creating nanocrystals, quantum dots, nanorods and nanowires of various dimensions. Nanoflower fabrication was not on our agenda. This interesting phenomenon was a by-product of our Nanowire fabrication. When we failed to produce Nanowires, due to some unintended discrepancy in experimental set up, we were rewarded by exquisite and exotic patterns of copper appearing as nanoflowers. Electro-deposition technique used in our experiment is similar in principle to that used for the electroplating process. Commercially available polycarbonate membranes of 25 mm diameter with pore density of 0.1 billion pores per square centimetreand pore diameter of 100 nm were selected for this experiment. Anodic alumina membranes having apore density of one billion pores per square centimetre and an average pore diameter of 200 nmwere used as an alternative route for creating nanoflowers. Electrochemical cell used for growth of Nanowires was fabricated in our workshop using Perspex sheets.A copper rod of 0.3 cm diameter was used as an anode. The cathode consists of copper foil attached to polymer template by an adhesive tape of good conductivity. The electrolyte was preparedat room temperature by adding 20 gram of Copper Sulphate in 100 cc of distilled water. A few drops of dilute Sulphuric acid was added to make it conducting.The inter-electrode distance was kept 0.7 cm and a current of 2 milliamperewas applied for 10 minutes. The polymer template was dissolved in dichloromethane to liberate copper nanoflowers from the host matrix. When experiment was repeated using anodic alumina, Copper nanowires were produced in the centre of the template andnanoflowers appeared on the periphery, perhaps due to poor contact. The Scanning Electron Microscope was used to record top and side views of grown nanoflowersunder different magnifications. So far, there is no specific theory to explain exotic patterns developed during electro-deposition of copper in anodic alumina or polymer templates. A speculative explanation has been provided by some researchers on the basis of over-deposition. During the growth of copper nanowires in the template pores, the current remains nearly stable until the wires arrive at the template surface. If the electro-deposition process is not stopped at this stage, the current keeps rising gradually leading to over-deposition of copper. In our experiments, it was observed that the growth of nanoflowers depends on two factors: cathode over-potential and conductivity of the cathode surface. If conducting film is used for the cathode surface, copper ionswill tend to deposit into nano-channels of polymer template, otherwise they tend to grow laterally on the cathode surface. The deposition of copper takes place only when the potential of the cathode is lower than the equilibrium electrode potential of the electrolytic cell; hence, a certain magnitude of cathode over-potential is necessary. It has been observed that the best flower patterns are created by electro-deposition of copper in polymer templates. Due to poor conductivity of polymer, free flow of copper ions into pores of template to form Nanowires is restricted, resulting in the over-deposition at the cathode surface in the form of nanoflowers. The beauty of these experiments is that no identical patterns are produced on repeating the experiment. It remains an enigma and defies scientific explanation. In case of anodic alumina template, copper nanowires were grown in central region and nanoflowers in the peripheral zone. It clearly proves the hypothesis of differential deposition of copper on the cathode surface. It is difficult to determine the exact conditions under which nanoflowers are synthesized along with nanowires.